My God, We Finally Did This. After 7 years of heartache and anguish, a chapter is finally closed. 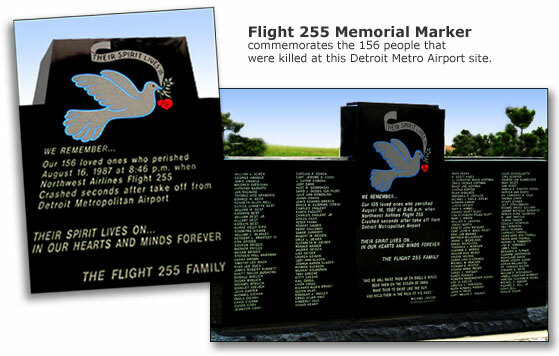 The permanent memorial marker at the crash site honors Flight 255s dead. Families of the 156 dead people who died in the crash of Flight 255 have erected a permanent memorial for their loved ones at the site. The 5-ton, four-piece marker containing the names of the dead was unveiled at 7:00 PM on August 16, the 7th Anniversary of the crash, on a hill at I-94 and Middle Belt Road. The 3-section 14-foot long black granite monument was erected the week before the 7th Anniversary by crews from Black Monument, The Grand Rapids based company, which also designed the memorial. The 6-foot tall centerpiece is flanked by two 54-inch side sections and encircled with newly planted pine trees. The design is a compromise between the 10-foot tall marker the families wanted and the flat monument that the state suggested, Polec said. On the back of the monument is a poem written by Duane Adams of Royal Oak titled, Final Flight. It is really beautiful said Kay Gleason of Shelby Township, who lost her husband, Pat, in the crash. It has been a long time coming. Some of the Flight 255 Family members, including Polec and Gleason, are convinced that it took so long to get the marker because the county, state and Romulus didn't want a memorial at the site. We accomplished our goal, Polec said. We wanted a marker on that crash site. It's really an end of an era. It's like, My God, we finally did this. Excerpts taken from The Detroit News article.